Who would think that investment audit reports could be so interesting? 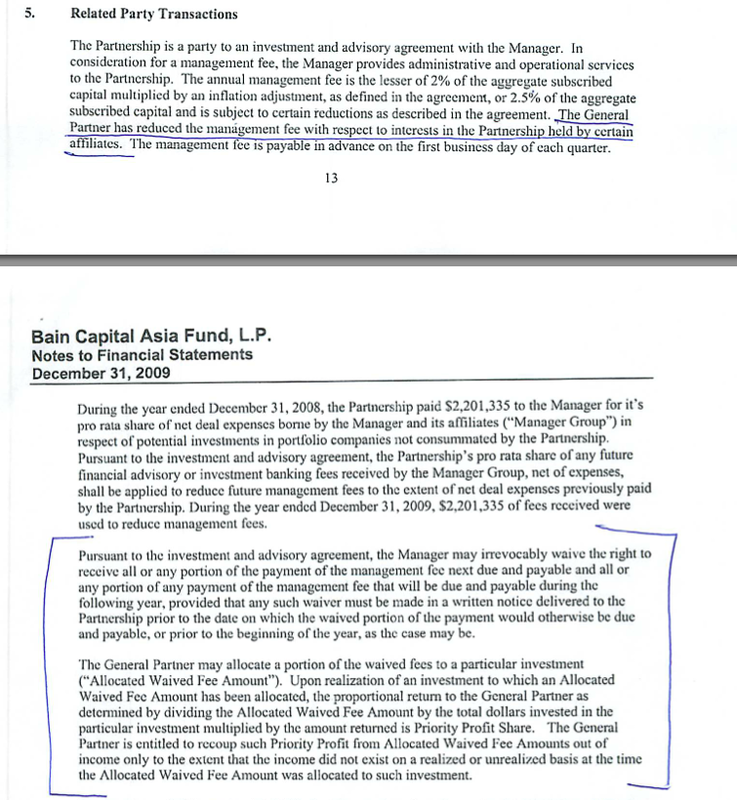 Reports that should be available to any investor in the various Bain Capital investment funds, including the Romney’s of course. Most remarkable perhaps is that no one has seen the really big story of these otherwise mundane reports. Here is that story, an epic tale of tax evasion. While the NY Times, Wall Street Journal and other leading publications do major stories on Bain Capital “waiving fees” in lieu of increased equity positions, they have failed to ask the most basic question. That is, if these are such good investments and valued at historically low levels when made, why on earth would a limited partner give up an equity stake in lieu of paying management fees. The smart decision is to pay the annual management fee, not only because you don’t dilute your equity but you also get a valuable tax deduction. Investment management fees are indeed a perfectly legitimate tax deduction. The reason is simple, that is, most of the investors are tax exempt investors including foundations, endowments and public pensions. It makes no difference to them since the tax deductions allocated to them are worthless since they are tax exempt. Put another way, they don’t get the deduction. This also allows the tax exempts to bury fund fees. The parlor game being orchestated by Pricewaterhouse Coopers and Ropes and Gray is quite simple, that is, to move as much of these unusable tax deductions over to the taxable partners as possible, where they can fetch top dollar, that is be fully utilized. The best way to do this of course is to convert managment fees into priority equity profits which come with an increased allocation of both gains and losses/tax deductions. It is almost comical how leading tax scholars and analysts don’t see the endgame but are instead debating whether the rate should be capital gain or ordinary income, not seeing the impact of illegitimate carried interest deductions taken. The problem is that this scheme is directly against two important IRS rules, the Fractions Rule and a second rule mandating that all such allocations have “substantial economic effect.” This is not complicated but rather garden variety tax planning for partnerships. 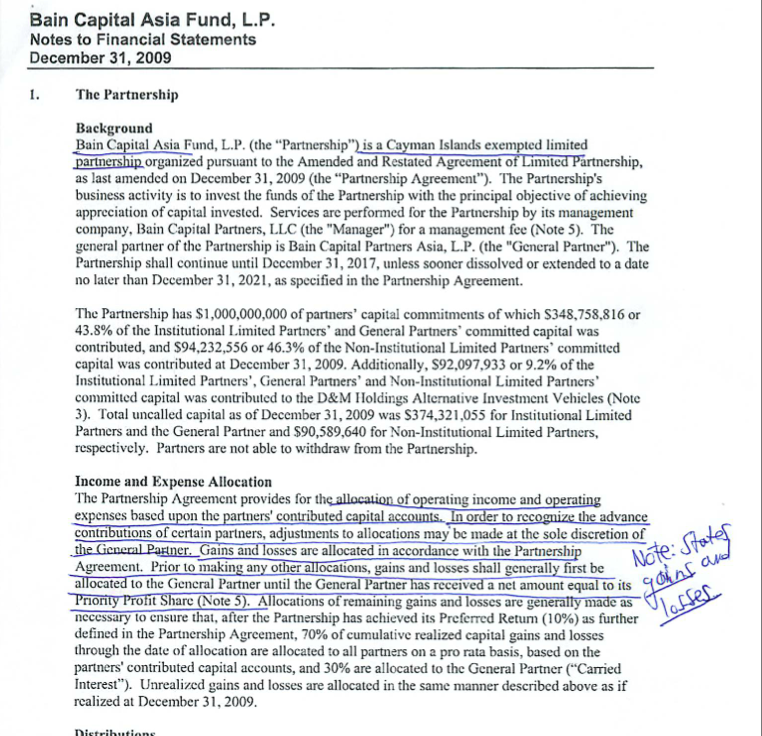 Below are documents taken from the gawker website outlining how this scheme works for the Bain Capital Asia Fund. Of course some investors will say, why not let the Bain Capital’s of the world use otherwise unusable tax deductions belonging to tax exempts. The reason is simple, this degrades the very state and federal tax base that is necessary to fund services, in particular pension commitments. Put another way, the end game of this scheme is higher taxes for the rest of us. And when it comes to charitable contributions I prefer education related causes rather than the fine folks who are clients of Pricewaterhouse Coopers and Ropes and Gray. Also from the same audit report is the following additional description.